Of course, it’s much more complex, because it has to deal with multi-line code, tab completion using readline, magic commands, and so on. But the model is like that: prompt the user for some code, and when they’ve entered it, exec it in the same process. 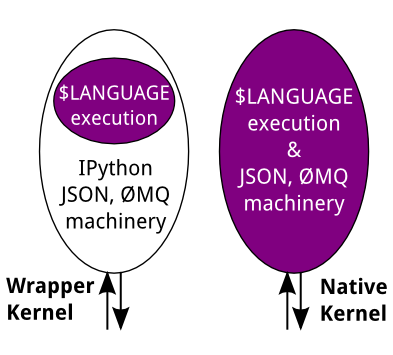 This model is often called a REPL, or Read-Eval-Print-Loop. 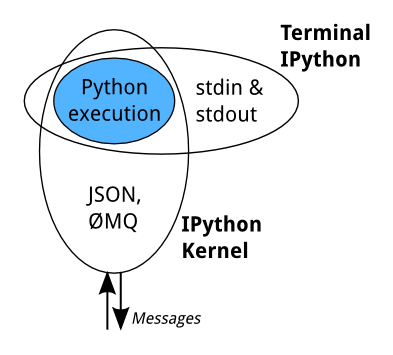 All the other interfaces—the Notebook, the Qt console, ipython console in the terminal, and third party interfaces—use the IPython Kernel. This is a separate process which is responsible for running user code, and things like computing possible completions. Frontends communicate with it using JSON messages sent over ZeroMQ sockets; the protocol they use is described in Messaging in Jupyter.